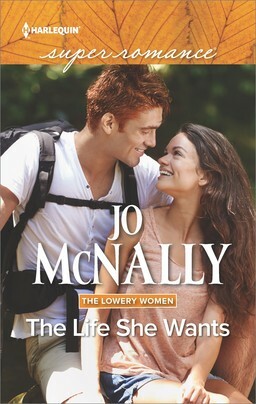 I had a first for Stand-In Wife, my August release and ninth book for Super – a pet with a story arc. When my heroine, Viv, swaps identities with her twin, only two immediately spot the deception. Her sister’s baby and her dog - non-verbal characters who tap into the sensory clues that everyone else misses. And I got a kick out of the comic potential of a dog-loving heroine who simply cannot get this dog to like her because he knows she’s an imposter. It was the most fun I’ve ever had doing research. First thing I had to do was choose my breed. It seemed to me that any kind of doodle would be automatically guaranteed a personality. And maybe a little bit of something to prove. So I went online and discovered the divesity of doodles - goldendoodles, bassetdoodles, airedoodles, cadoodles, cavapoos, sih-poos and bich-poos. Wonderful names, rich in imaginative and comic possibilities. But I needed a particular kind of dog for the story. My doodle had to be loving and loyal, intelligent but with a Sherlock Holmes ‘terrier’ quality that made him both protective and suspicious. When I read this about a schnauzer-poodle cross on http://www.dogtime.com/, I knew I’d found my match. The other good thing about schnoodles, for my story purpose, was that they came in all sizes, and colors which gave me the opportunity to follow my heart when I was scanning pictures searching for my dog. There he is at the top of the page. Introducing Salsa. Do you enjoy reading animals in fiction? Got any favorites you’d recommend? For me, it’s Phoebe Somerville’s French poodle, Pooh, in Susan Elizabeth Phillips’s ‘It Had To Be You.’ My favorite screen animal is Babe the pig (in the first movie, before Hollywood changed him). Make a comment and go into the draw for a signed copy of Stand-In Wife. If you want to read Salsa in action, check out this excerpt here. I love reading animals in fiction!!! I like dogs, cats, horses, almost any animal that has their own character shine through in the story. Can't wait to read Stand-in Wife. Going to read the excerpt now. In dogs, I always liked the mixed breeds. I think character is bred out of most purebreeds. Although we've had a couple that were incredible pets and watchdogs. Mostly though, my family went for the terrior crosses. I think Kristan Higgins wrote an excellent dog character in My One and Only. I loved everything about that book. I keep a healthy distance from animals, and they keep a healthy distance from me. I enjoyed Viv’s dog problem in Stand-in Wife (which I have already read and loved! ), because that’s exactly the way animals are with me. And – like Viv – I have a sibling who gets on with animals just fine. It’s embarrassing. My brief attempts at pet ownership growing up including plenty of kamikaze goldfish, and a guinea pig that escaped and was found a few blocks away (it goes without saying that my brother’s guinea pig stayed behind – it liked its owner). My dog (Biggles) is a schnoodle and they are loyal and fun loving - definitely hero-dog material *wink*. I love any story with animals, so couldn't pick one I don't think (I started with James Herriot's "All Creatures Great and Small"). Hey Snookie, so you're a terrier cross expert,I hope I've got them right then. I guess in my favorite animals list I should have mentioned Black Beauty...even though I'm nervous of horses in real life I loved horsey books as a kid and entered every coloring-in competition with a horse as a prize. (No idea how we'd have a horse in suburbia but that was mum's problem).Glad you liked the excerpt, Salsa was a lot of fun to write. I find animals provide some light and sweet moments in stories. Lovely to read. 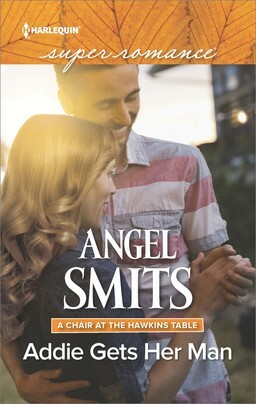 Sonya, I loved that Kristin Higgins book too, she's such a warm and funny storyteller. I have some sympathy for your animal exploits...I once had a goldfish and a cat I was sitting for someone get sick while they were away. Fortunately they made a full recovery. Marybelle, animals are great for comic effect. Like kids they express what they think with no filters. Thanks for the rec, Scarlet. I haven't come across Lucy Dillon. Will check it out. How freakish - I almost bought a shnoodle the other week! I was all set to make a huge drive into rural Victoria to buy this lovely puppy I had found, but then my neighbour mentioned how puppies love chewing shoes and I remembered that our closet doors are still sans handles after we painted, which necessitates them being left open all the time so we don't get locked out from our clothes... The thought of coming home to find my beloved new puppy gnawing on one of my Italian shoes made me feel a little dizzy. So we are holding off on puppy cuteness until we have made the house puppy safe. In the meantime, I will admire Salsa. Very cute pic! I'm a huge animal lover, so I like seeing them as part of the family in the books I read. I loved reading your description of a schnoodle since my first dog love was a Schnauzer who was fiercely protective of me...kinda caused a problem when we had our first child. Gatsby didn't really care for anyone horning in on his mama. He was beautiful, too. I still miss him so much. I love animals so love reading about them as characters in books. OMG, I know a Schnoodle! He's a great dog, too. And that dog you have pictured is absolutely adorable. I like reading animals in fiction. For me, too, it brings to mind Kristan Higgins' books. Karina, do you actually write scenes from Salsa's pov? I'm a fan of stories with animals. 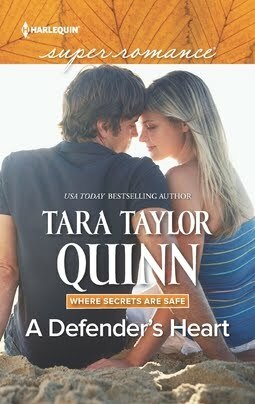 One of my favorite books is Jennifer Crusie's Anyone But You, and I loved the movie Flicka with Tim McGraw. I love reading about pets in my books. I have been reading a lot of those type books lately because I have been on a Kristan Higgins kick lately and she has pets in her books. I love it when pets are included in books! I, too, loved KH My One and Only. 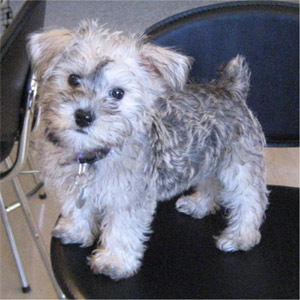 Never heard of a schnoodle, but would love one....missing the Schnauzer we had! I love dogs (and other animals, too) in fiction as well as in real life! Little Angus from Kristan Higgins' Too Good to be True comes immediately to mind. I'm VERY partial to terriers of all kinds. Lassie also comes immediately to mind since I had collies growing up. As for little Salsa, I think he's adorable! Not sure what a cadoodle is, and I don't guess I've ever seen an Airedoodle, but the rest I've seen and thought they were adorable. After DH and I got married, a friend found a dog in the middle of the road on her way into work. She rescued her and, because her older shih tzu didn't get along well with other dogs, she asked me if I could take the dog home for a few days while she put a Found ad in the paper. When I called DH to tell him I was bringing a dog home, he said, "You know I don't like a dog in the house." (We had a Kees Hond in the back yard.) I told him it would only be for a few days. Well, within 5 minutes of arriving home, Pepper (as we named her because of her coloring) had completely charmed him, and the "few days" turned into 11 years. She was a schnoodle and was a wonderful, wonderful animal! In fact, she is pictured in the first two pictures in this set http://www.flickr.com/photos/30583174@N03/sets/72157607557555039 with my daughter. Her successor, a Cairn terrier mix, is in my avatar and is also pictured following the first two pictures in that set (along with our other furry family members). Sarah, how's this for even more freakish, my fictional schnoodle chews the heroine's designer Italian shoes. Maybe we have a telepathic connection and I'm mining your subsconscious for story ideas? Liz, Gatsby sounds adorable. It must have been interesting trying to reconcile your new baby with your old baby. Another dimension to first time motherhood. Wonder if anyone's written a story about it? Good luck with your own foray into furry friends. jcp, thanks for stopping by. I remembered I have written a pet arc before...Roland the rat in my first book, Mr Imperfect. Sorry, Rolly, for forgetting you. I love pets in stories, they add a fascinating dimension and Salsa looks absolutely adorable. We have a house full of pets and each and every one of them brings a special something to the family mix. I'm looking forward to reading Stand-in Wife. Helen, no, I didn't write the schnoodle's point of view, though I know there are romances out there that do that. Can anyone help us out here? Bri,was Bob a hamster? I'm having a blank-out here, it's so long since I read the books. Summer, who can forget Flicka...I read My Friend Flicka as a kid. Never saw the movie. Jenny Crusie is a huge dog lover, I think she has half a dozen. You've reminded me to read, Dogs and Goddesses, a book she wrote with Anne Stuart and Lani Diane Rich, and you've helped with an earlier question. A book with a dog's point of view. Thanks! Congrats on the new release, Karina. I do like reading about pets in fiction. Susan Donovan(Ain't Too Proud to Beg) and Elaine Fox(Guys and Dogs) are some of my favorites. Virginia and Jackie S - Kristin Higgens is a popular choice this morning. My favorite book of hers was Catch of the Day. Jackie, you're the second person to have had a schnauzer on these posts, must be a popular breed. JV, from memory a cadoodle is a King Charles spaniel and Poodle cross but I'm impressed you've seen all the other breeds of doodle. I didn't know most of them. I love the pic of Pepper in the denim/daisy hat, no wonder your husband couldn't resist her. Let's face it, once you have an animal in need in your house, you're history. We inherited a cat that way. Hi Toni, you'll have to include your menagerie in a book. My parents nursed a magpie to health once and it was the most cantankerous, demanding bird you could image, but he'd be great for a story one day. Jane, I've yet to read Susan Donovan but I keep hearing great things about her books. Thanks for the reccie. Karina, don't I know it? In that same set of pictures, you can see Meijer, a cat (about 14 days old when we got him) who was supposed to stay with us just one night until a rescue org could take him. It's been 7 years, and he's still here. My daughter called us frantically about a cat she found on a walk with an injured paw. (Daughter in the photo, now 21, has 3 cats, 2 dogs, a miniature pot-bellied pig, and 3 sugar gliders, most of them rescues.) Knowing she had no room or resources to take care of the wounded kitty, we took her to the vet only to find -- she's pregnant. For now, we're nursing her back to health, but I have great fear she and her litter are going to wind up staying with us. We already think she's such a sweet cat. However, since we have 2 cats, a dog, and a chinchilla, we really don't need a pregnant mother kitty as well. Aaaargh! Hi Karina--Can't wait to read your book and meet your dog! I love writing animals. In Cop On Loan, the cop hero's Great Dane, Muttzilla, faces off with the heroine's giant cat, Ghengis Khat. The animals were as much fun to write as the people. And in Cowboy Comes Back, the hero and heroine head out to rescue an injured horse that once belonged to the hero and is now running with a mustang herd. Animals are such a huge part of my life that I find them working their way into books where I never intended to have an animal. Oh, and I love Babe, too. JV, you've definitely got a menagerie going on. Love the sound of your daughter's miniature pot-bellied pig but I've never heard of a sugar glider so I looked it up, 'a small gliding possum, native of Australia and particularly popular in the US as pets.' Who knew! 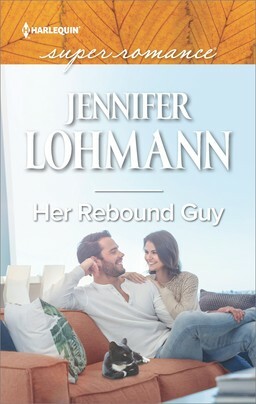 Jeannie, Cowboy Comes Back was a lovely story...I haven't read Cop on Loan, will have to remedy that! Mutzilla and Ghengis Khat...you must have had such a lot of fun coming up with those names. Just finished Stand In Wife last night (Great story!). Salsa was a great dog. I totally identified with the Italian leather shoes... I lost three pair to a new puppy a few years back... My first dog story was Big Red by Jim Kjelgaard, the story of an Irish Setter. I tend to like bigger dogs with some herding instincts - part border collies or mountain dogs. I like stories with animals. I don't have any favourites. Linda, I'd love a border collie one day, but I know they needs lots of space, exercise and probably a job to keep them happy. My farming uncle had a lot, where is where I grew so fond of them. Glad you enjoyed the book. Karina, animals are often pivotal characters in my books. In Love, By George, George is a Harlequin Great Dane. I wrote an opening few paragraphs for each chapter in George's POV, but my editor at the time chose not to use them. She suggested I put them on my website, which I did, but I was sorely disappointed and I think a lot of my readers were, too. Alas. He was still a great dog. I've never heard of so many doodles, but my niece and nephew who live nearby have a golden doodle and she is a the sweetest big dog I've ever met. Just love her. You book sounds great. I love twin stories. Karina, what a gorgeous little dog. I want him! But I've already got a wonderful Jack Russell terrier who has featured in four of my books so far. He's got a big dog brain in a little dog body, too. Your heroine switch with the 'dog who knows' sounds like a lot of fun. Can't wait to read it. Deb, you were obviously ahead of your time in giving George a POV. Wonderful title. And the perfect name for a Great Dane. I have a friend with a golden doodle, also a lovely animal, very friendly and cute. Joan, it must be fun to write your own pet into a book, except I have enough trouble getting my characters to do what I want without adding an independent cat. Bri, thanks for clarifying. I had a soft spot for Rex. I don't think I got to book ten. Much as I love Stephanie Plum, I started getting frustrated by the love triangle. I enjoyed reading Kandy Shepherd's HOME IS WHERE THE BARK IS (and am waiting to read LOVE IS A FOUR-LEGGED WORD with much anticipation). I found the dogs acted realistically (as did all the characters, LOL!) and added a lovely element to the love story. Under "normal" circumstances I adore animals in romance, now that I just lost my beloved cat I avoid them. It's a bit too much to handle. But when time takes away the edge of the immens pain I think I'll go back to them. Laney4...wow I'm getting all kinds of recommendations for 'animal' books. What wonderful titles Kandy Shepherd has. Jo's Daughter, so sorry you've lost a beloved pet. So your heroine couldn't fool the dog or baby. Those details are so wonderful. I like horses but right now all I can think of is Black Beauty. I like animals in my romance novels. To be honest, I rather have a cat or a dog in it than a child at some times. ;) The last book I read with animals in it was Animal Magnetism by Jill Shalvis which I loved. She does a great job of involving all kind of animals (lika a goose) into the story. Jo's Daughter, hugs on your loss. I enjoy reading animals in romances. They can give the characters a chance to show their softer side, or act as lie detectors as yours does! I was wondering what sort of dog my hero gets the child character in the story I'm working on now- looking at that adorable picture of Salsa it just has to be a schnoodle. "Animal Instincts" by Nell Dixon has some fun animals in it as she runs a refuge. The foul mouthed parrot sticks in my mind the most. Laura, my heroine can talk her way out of a paper bag - dogs and babies are instinctual and impervious to argument. Actually so are kids come to think of it...and teenagers. ClaudiaGC, I'm a huge fan of Jill Shalvis's blog. It's easy to see how she writes such warm funny books and her natural connection to animals is clear there too. Autumn, I love the idea of a foul-mouthed parrot. There was one in Georgette Heyer's The Grand Sophy come to think of it, and a monkey. The heroine decided the hero couldn't be bad because the animals all liked him, which was a lovely touch. I really liked the dog in SEP's Ain't She Sweet, too, though I can't remember his name. I just remember that her treatment of the dog went a long way toward redeeming the heroine for me, and I remember that the dog started liking her a lot better about the same time I did. JV, intersting isn't it that we tend to trust the judgement of animals. I wonder if SEP planned it that way. Thanks Karina & Autumn Macarthur ! Animals can make u happy and angry.But i always love animals.Thank u so much for ur wonderful post.Animals can be used as a romantic gift. I love this post, especially now that I have a puppy. I loved the collars featured in Elle Decor. The little bone buckle is too cute. The temple feeder is also super cute.